Okay, let’s take a step into the future. 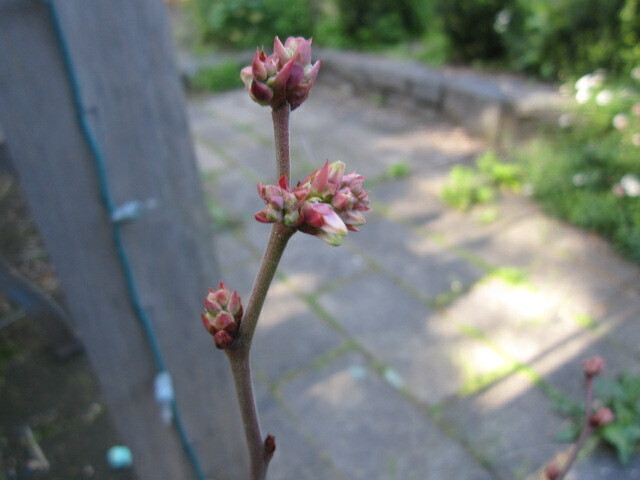 At the moment my blueberry plants are very young, and I believe it will take a couple of years before they get any fruit, but just imagine it. 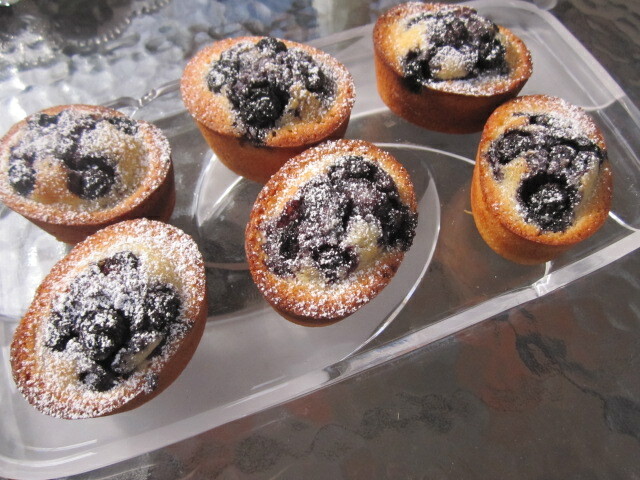 I can almost see a glass platter of magnificent blueberry friands. In the meantime I shall have to continue buying blueberries when I have the urge to use my friand pan, but they say good things come to those who wait. Let’s just be patient. Back in 1985 we had moved into this house in March. 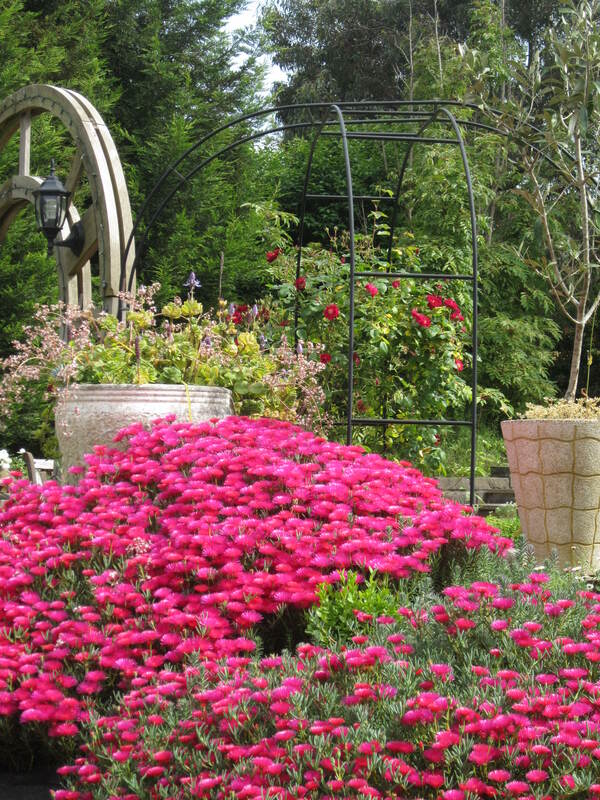 In August we decided to go to the Home Show in the city of Melbourne to get some ideas. 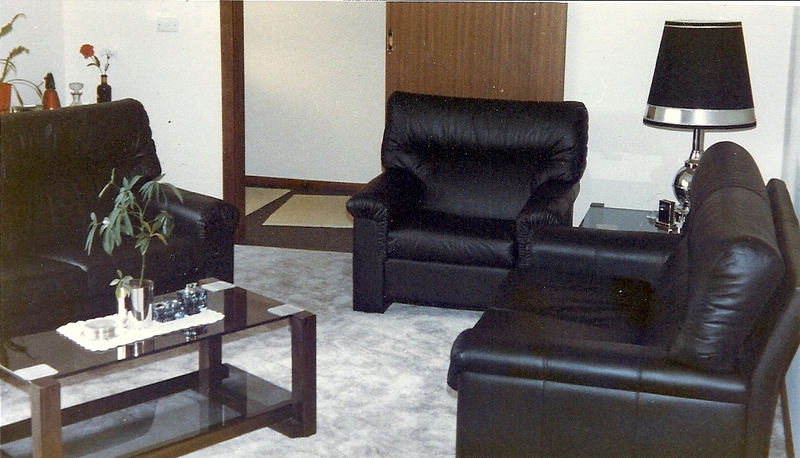 By the time we reached the stand of leather lounge suites we were already tired, and as we sat down on the black leather club armchair, we were both blown away by its comfort, as well as its sleek, classic but modern look. Just as a matter of interest, we asked the guy how much it would cost if we were to buy two armchairs and a pair of two-seater matching couches. Usually at the Home Show if you order something they give you a good deal, but the price he quoted us was very reasonable, almost as if he had forgotten to add one of the armchairs on. We ummed and ahhed and suggested we might walk around and come back later. By this time he had realised his error so told us if we stepped off the stand the offer would be over. We were still setting up the inside of the house at this stage, and a beautiful leather lounge was not currently on the list of must haves. Suddenly however, it was on the list at Number One. Signing up, we ended up borrowing from his parents and paying it off over the next few months. We still have this lounge suite, rather worn and somewhat scratched by the cats, but we still love it and are glad we stretched ourselves to buy it. Today marks the twenty-seventh anniversary of signing on the dotted line. Oh, by the way, we have never been back to the Home Show for fear of buying something else major!! 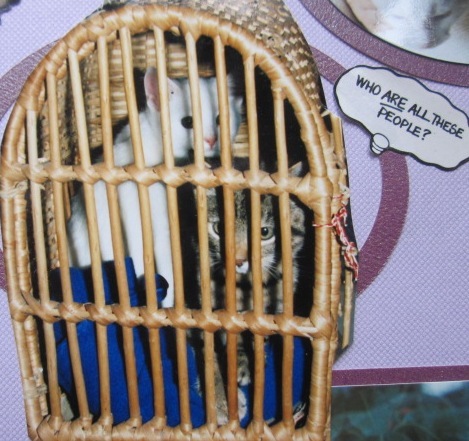 While I’m still in my time machine I thought I would take you back to 1985 when we got our first babies of the feline variety, Bubble and Squeak. We got them from the Blue Cross, an animal shelter, and fell immediately in love with them both. 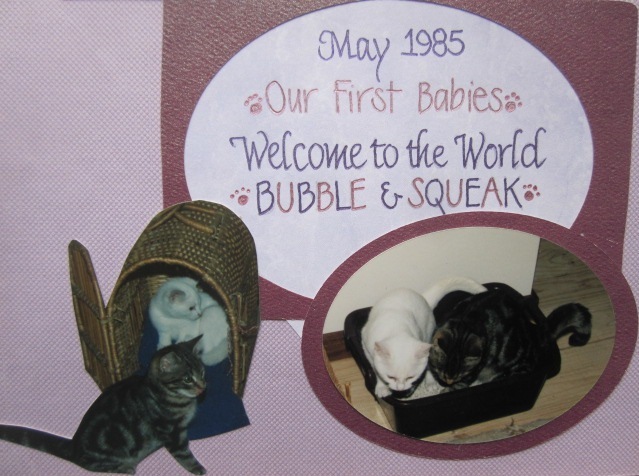 Bubble was the white one, while Squeak, who was affectionately called Squeaky, was a lovely grey tabby. In Australia we tend to shorten most names, and if we don’t shorten them we add a Y or and IE to the end of the word (footy, barbie, hubby, etc.). 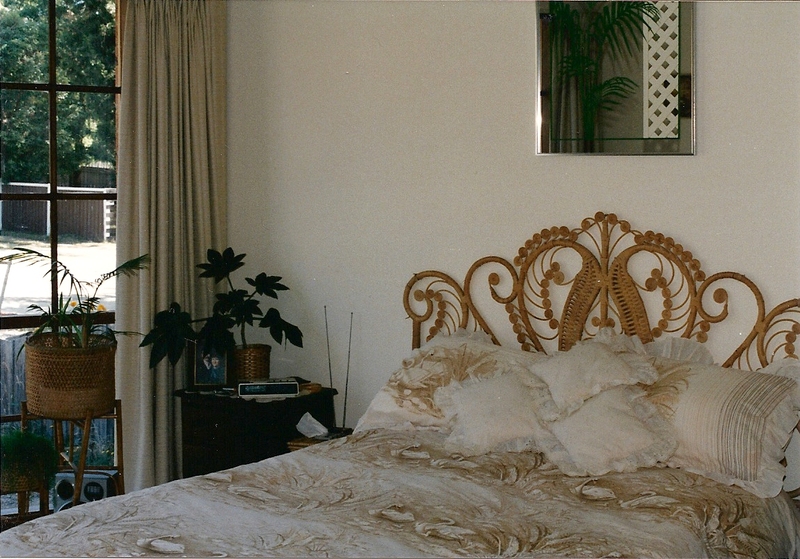 When we first moved into this house twenty-seven years ago, we had a cane themed bedroom, which fulfilled my need for a tropical oasis. 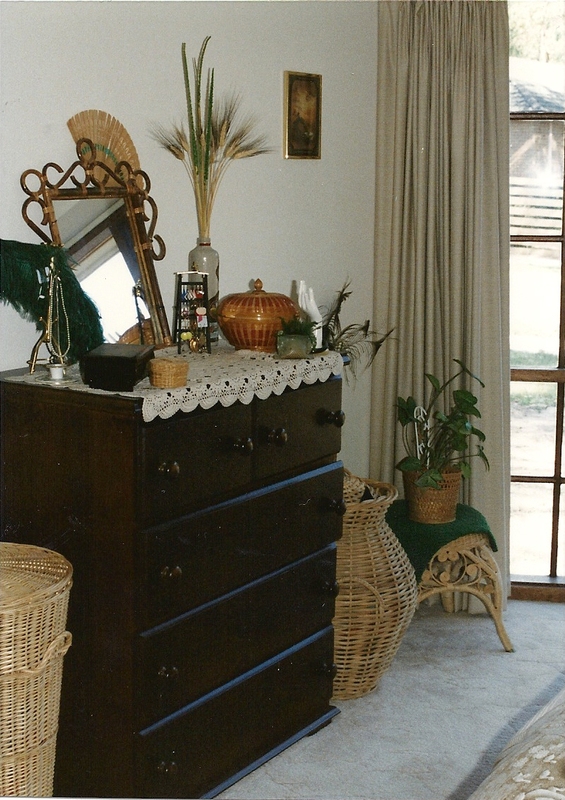 The cane chair and bedhead are long since gone, with only the palm and lattice printed mirror surviving the intervening years. Now that I’m goin’ troppo outside, let’s jump in the time machine and take a wander back to the late 80’s. I love the technology that enables us to scan a picture and then upload it into cyberspace. Back in 1986 when I took these photos with film, who would have believed that we would come this far?